"The Deep Zone" was hailed as "an absolutely phenomenal read by the new Michael Crichton" (Brad Thor), a book that "should come shrink-wrapped with a seat belt" (Steve Berry). Now, bestselling author James M. Tabor ups the ante and the action in his second extreme thriller, as brilliant and battle-tested heroine Hallie Leland confronts intrigue and murder in the most unforgiving place on Earth. The South Pole's Amundsen Scott Research Station is like an outpost on Mars. Winter temperatures average 100 degrees below zero; week-long hurricane-force storms rage; for eight months at a time the station is shrouded in darkness. Under the stress, bodies suffer and minds twist. Panic, paranoia, and hostility prevail. 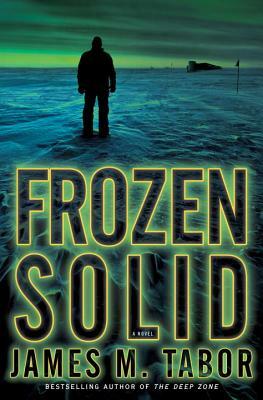 When a South Pole scientist dies mysteriously, CDC microbiologist Hallie Leland arrives to complete crucial research. Before she can begin, three more women inexplicably die. As failing communications and plunging temperatures cut the station off from the outside world, terror rises and tensions soar. Amidst it all, Hallie must crack the mystery of her predecessor's death. In Washington, D.C., government agency director Don Barnard and enigmatic operative Wil Bowman detect troubling signs of shadowy behavior at the South Pole and realize that Hallie is at the heart of it. Unless Barnard and Bowman can track down the mastermind, a horrifying act of global terror, launched from the station, will change the planet forever--and Hallie herself will be the unwitting instrument of destruction. As the Antarctic winter sweeps in, severing contact with the outside world, Hallie must trust no one, fear everyone, and fight to keep the frigid prison from becoming her frozen grave. ""The Andromeda Strain" meets "The Thing." Effectively blending horror with the science thriller, Tabor keeps readers on edge from beginning to end." --"Booklist"
"The suspense was never-ending. . . . There's a] heart-stopping build-up towards the ending."--Books4Tomorrow. James M. Tabor is the bestselling author of "The Deep Zone, Blind Descent, " and "Forever on the Mountain" and a winner of the O. Henry Award for short fiction. A former Washington, D.C., police officer and a lifelong adventure enthusiast, Tabor has written for "Time, The Wall Street Journal, The Washington Post, " and "Outside "magazine, where he was a contributing editor. He wrote and hosted the PBS series "The Great Outdoors" and was co-creator and executive producer of the History Channel's "Journey to the Center of the World." He lives in Vermont, where he is at work on his next novel.